While it could be argued that Valentine’s Day has become a tad over-commercialised in recent years, if there’s a time to show your romantic side, February is the month to do it. But if the slushy shop displays leave you cold and you want to do something a little more original during this most romantic time of the year, we have some ideas in this week’s blog. Firstly, keep it personal. While it’s hard to move for heart emblazoned cards and red roses in the shops right now, doing something a little unique to you as a couple is a much more thoughtful gesture than resorting to a shop-bought card or pressie. How about finding a map image on the internet of the place you first met, where you got married or where you went on your honeymoon? Or it could just be a place that holds a special place in your hearts. Scale your image to size, print it off and then cut a heart shape out and stick onto a piece of card – a simple but effective card for Valentine’s or one to keep in reserve for another significant occasion, such as your anniversary. 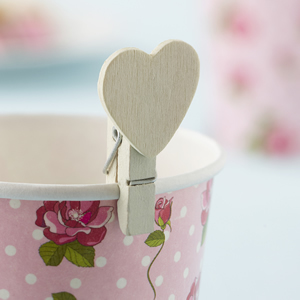 Use one of our Vintage Rose wooden pegs and clip a small gift to the card – cinema tickets for two, perhaps, or a voucher for a ‘his ‘n’ hers’ spa treatment, a lovely, indulgent treat sure to be more appreciated than an over-priced bouquet of flowers. If money’s tight, make DIY ‘love tokens’ or vouchers, inscribed with special treats for your recipient to look forward to, such as breakfast in bed, a walk in the park, a fully body massage…you get the idea! Alternatively, how about making up a personalised ‘goody bag’, filled with carefully chosen items your partner will love. These don’t have to be expensive, but it’s important to put some thought into your choices. 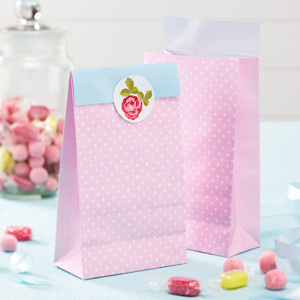 Our Vintage Rose party bags can be used for this very purpose. Pop in a mini bar of luxury chocolate, for example; take a look at the gorgeous goodies created by artisan chocolatier Rococo for inspiration. You can buy online or in specialist stores and larger retailers such as Waitrose – we love the boxed hand-painted chocolate hearts, which would look lovely nestled in your gift bag. Or how about a tube of the classic Love Hearts for a cheaper alternative. Add in a piece of jewellery, perhaps, a gorgeously scented soap, and for men something that combines a bit of practicality, like a personalised key ring, or a pair of cufflinks. Take a look at the exhaustive range on Notonthehighstreet.com where you’ll find some great unisex ideas that won’t break the bank. If you live by the mantra that the way to a man’s heart is through his stomach then you won’t go far wrong presenting your loved one with breakfast in bed as a prelude to romance. Make it extra special by cutting toast into heart shapes using a cookie cutter, swapping tea for champagne and adding one of our Vintage Romance lottery ticket holders to your breakfast tray. If cakes are their thing, a batch of pink-frosted cupcakes, encased in our Vintage Rose cases are another simple, romantic gesture. Perhaps you’re taking advantage of this time of year to make a special proposal. Why not create an extra element of surprise by adding your ring to a Valentine’s Day goody bag, in amongst the other bits and bobs? Or pop it into an organza bag, filled with chocolate hearts…a more creative way to present your loved one with their special piece of jewellery. This entry was posted in Elegant Entertaining and tagged celebration, Chocolate, DIY, hearts, love, Romance, rose, Valentines, Vintage by Neviti. Bookmark the permalink. Adam on Easy tips for children’s parties.